Keep everyone “in the know” and up to date with these enclosed bulletin boards. With a well-placed cork board, you can ensure that employees, students and visitors get the information they need. Whether you want to publicize important school events, send visitors in the right direction or acknowledge a job well done, cork boards are an excellent option. When you tack or pin something up on one of these self-sealing natural cork bulletin boards, you want to be sure that it will stay put. Secure shatterproof doors with heavy duty locks will keep your papers in place until you are ready to remove them. 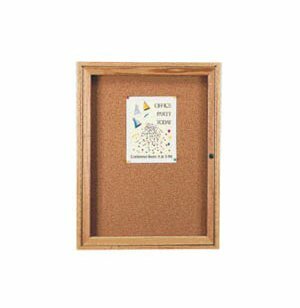 An attractive solid oak frame creates a professional finished look that makes these cork boards appropriate for both professional and academic settings. 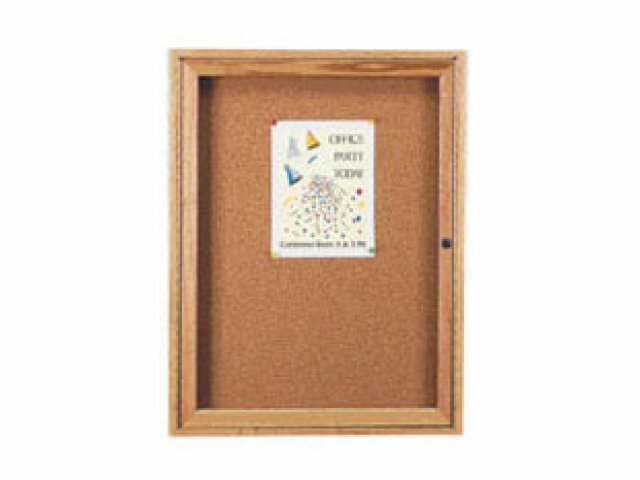 Sleek Design: A solid oak frame with high-gloss clear lacquer finish gives these cork boards a polished appearance. Resilient Material: Self-sealing natural cork will maintain its shape and strength even with repeated use. Paper Protection: Secure, shatterproof acrylic doors prevent papers from getting torn, crumpled or dirty. Tamper-Proof:Heavy-duty, disk-tumbler locks provide superior security (two keys included).